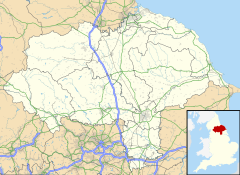 Moorsholm is a village in the unitary authority of Redcar and Cleveland and the ceremonial county of North Yorkshire, England. The village lies 5 miles (8.0 km) from Saltburn-by-the-Sea between the North York Moors and the North Sea. Because of its proximity to the North Sea coast the area was vulnerable, historically, to attack by invaders from Scandinavia. The name of Moorsholm is of Viking origin with the suffix holm, which meant a settlement, being affixed to the location of the village by the moors: so meaning settlement by the moors. The village used to be called Great Moorsholm to distinguish it from a farm called Little Moorsholm, which is the other side of the Hagg Beck Valley to the north. 'Little Moorsholm' is a title now more commonly applied to a more modern housing estate between that farm and Lingdale. The settlement was mentioned in the Domesday book as Morehusum, belonging to the Earl of Morton and later Clan Bruce, ancestor to the kings of Scotland, and from them descended to the Thwengs, Lumleys, and others. It was a planned mediaeval village built along a main street with crofts and their associated tofts on each side. The church of St Mary, Moorsholm, was built in 1892 and is of stone in 12th-century style. It consists of chancel, nave and west tower. The Memorial Hall was built as a war memorial in 1957 and is used as the doctors’ surgery and meeting room. About 1 mile (1.6 km) to the south of Moorsholm is the landmark of Freebrough Hill, a detached natural hill which is conical in shape. Whilst being only a small village Moorsholm has a few sports available, with some ventures having to recruit better players from local teams such as Loftus and Guisborough. Moorsholm Athletic is the village football team. It is for under-15s and is currently in Division 5 in the Teesside Junior Football Alliance (TJFA). In recent years villagers have started their own tournament, pitting the under 30s in the village against the over 30s as an 11-a-side extension of the popular summer 5-a-side fixture. Quoits and darts are two of their most successful sports. A cricket team is ever-present in the summer playing on the recreation field. In 2011 the team played in the Langbaurgh Cricket League division 1. With the help of Guisborough CC the club ran an under-14 team in 2011. ^ "GENUKI: Skelton In Cleveland Parish information from National Gazetteer 1868". www.genuki.org.uk. Retrieved 23 July 2008. ^ "Parishes - Skelton". British History Online. Retrieved 23 July 2008. ^ Morgan, Mike (20 December 2011). "Community hall seeks Wish tokens to help buy new lighting". Gazette Live. Retrieved 1 June 2017. ^ "Moorhouse - Morebath". British History Online. Retrieved 23 July 2008. Wikimedia Commons has media related to Moorsholm.